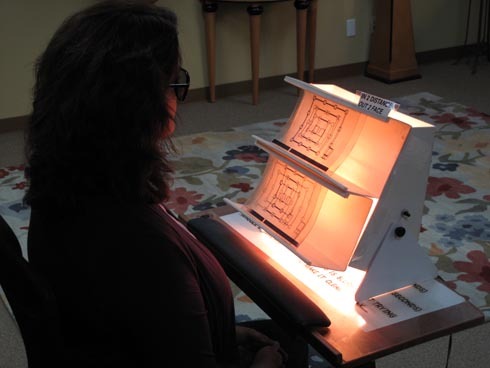 Orthoptics Vision Therapy (OVT), as practiced at the Center, teaches clients how to use the muscles affecting vision more efficiently to improve their vision. OVT consists of exercises addressing three areas: eye muscle coordination, focusing flexibility, and eye tracking movements. Eye muscle coordination teaches the client to use his/her muscles related to the eye in a synchronized manner. Symptoms of decreased eye muscle coordination are: eye strain, headaches, blurry vision, and double vision. These symptoms lead to drastic changes in a person’s lifestyle, including, lack of interest in reading, avoiding homework, becoming sleepy after minimal work, trouble with driving, and a decreased ability to play sports requiring visual acuity and tracking. Focusing flexibility is the ability to focus quickly from one object to another, both near and far. As with poor eye muscle coordination, poor focusing flexibility can impact reading. Individuals with poor focusing ability will also often notice fluctuations in vision acuity throughout their workday. This is especially prevalent in people who work regularly with computers. Eye tracking is one of the main causes of reading disability. For many individuals with this problem, just going from one printed line to another can be a monumental challenge. Inadequate eye tracking makes it difficult to stay on task. Many students with this problem become frustrated and quickly lose interest in learning and reading. Consistent and correct performance of the exercises used by the Vision Center will often cause meaningful lifestyle changes and enhance general quality of life. Common areas of improvement include reduced fatigue; enhanced interest in learning; improved reading comprehension; and greater proficiency in athletics and driving.